Pope Francis has formally accepted the resignation of suspended Bishop of Limburg Franz-Peter Tebartz-van Elst, the Vatican has announced in a statement on Wednesday. The senior German Church leader has been suspended over his alleged lavish spending. Bishop of Limburg Franz-Peter Tebartz-van Elst, 53, has been accused of spending more than 31 million euros ($43 million) on renovating his official residence. The cleric, dubbed the “bishop of bling” by the media, offered to resign when the scandal broke last October. In response, Pope Francis temporarily suspended Bishop Franz-Peter Tebartz-van Elst and instructed a Church commission to investigate the matter. Pope Francis has repeatedly expressed his disapproval of senior clerics whose lifestyles seem too lavish. On Wednesday, the Vatican said the inquiry found that the senior cleric could no longer exercise his ministry. The Church called on the diocese of Limburg to accept the decision “with docility” and to work toward restoring a “climate of charity and reconciliation”. The Vatican did not further elaborate on the future of Bishop Franz-Peter Tebartz-van Elst, but said he would get a new position “at the opportune time”. Auxiliary Bishop Manfred Grothe has been appointed to run the Limburg diocese. 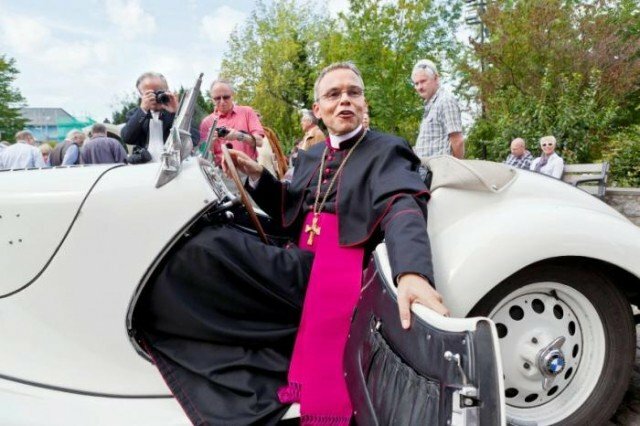 Bishop Franz-Peter Tebartz-van Elst and his luxury lifestyle have become infamous in Germany, where many people pay a Church tax to the state. The tax raised 5.2 billion euros for Catholics and 4.6 billion euros for Protestants in 2012. At the heart of the criticism was the refurbishment of the cleric’s official residence, originally set to cost 5.5 million euros. German media reported that the quarters were fitted with a 15,000-euro bath, a conference table for 25,000 euros and a private chapel worth 2.9 million euros. Bishop Franz-Peter Tebartz-van Elst was also under fire for a first-class flight to India to visit the poor.